Planning on getting married or eloping in the Adirondacks? 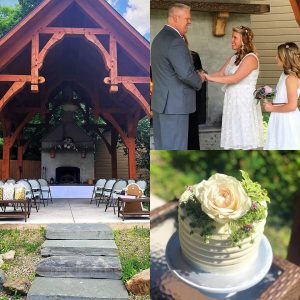 The Alpine Lodge in North Creek is the romantic Adirondack wedding venue you have been searching for! Our spectacular mountain views and charming Adirondack themed lodge all combine to create the perfect destination to get married. Set against the breathtaking backdrop of the Adirondack Mountains in North Creek, NY, a summer wedding in Upstate NY offers the picturesque wedding you’ve been dreaming of. Lose yourself in the stunning beauty of the Adirondack Mountains! The Alpine Lodge is the perfect Adirondack Summer elopement venue. For more details on our elopement packages in the Adirondacks, please give us a call at (518) 251-2451 or fill out our quick and easy contact form online. We look forward to helping you plan the perfect day! At The Alpine Lodge, our Adirondack elopement package includes an Officiant and Witness for the ceremony, the bridal bouquet, a sparkling wine toast and custom boutique wedding cake. The package costs $380 plus tax added to the couples room rate.